W&L Theater Presents Children’s Favorite “James and the Giant Peach” “James and the Giant Peach” follows the story of James, a forgotten and lonely child, played by Arthur Love ’18. 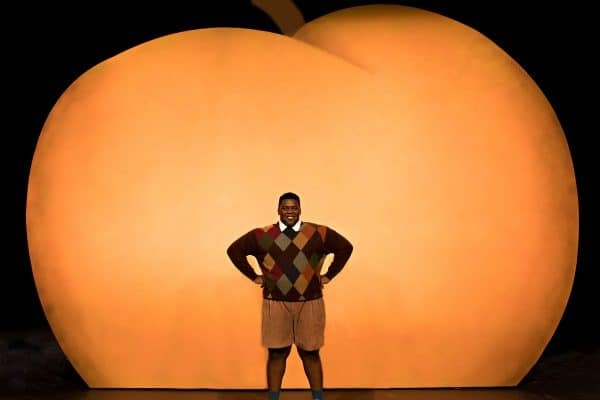 Washington and Lee University’s Department of Theater, Dance and Film Studies presents “James and the Giant Peach.” The show runs Feb. 8-10 at 7:30 p.m. and will also run on Feb. 11th at 2 p.m. at the Keller Theatre, Lenfest Center for Performing Arts. Tickets are required and may be ordered online at lenfest.wlu.edu or by calling the Lenfest box office at (540)-458-8000. “James and the Giant Peach” follows the story of James, a forgotten and lonely child, played by Arthur Love ’18. James is forced to live with his mean and wicked aunts, played by Katie Cones ’21 and Rachel Rothken ’19. Finding his escape from his nightmarish life in the form of a gigantic magic peach, he sets sail across the ocean and becomes friends with magically altered garden bugs: Miss Spider, played by Melissa Yorio ’21; Centipede, played by Mike Bracey ’20; Green Grasshopper, played by Will McLearn ’20; and Earthworm, played by Hailey Glick ’19. Rockbridge County and Lexington City elementary school students will be taking field trips to the Lenfest Center to watch the show. “I am absolutely excited to bring these students into the whimsical world we have created and I hope they like my portrayal of James and all our efforts put into this amazing play,” Love said. Box Office hours are Monday – Friday, 9-11 a.m. and 1-3 p.m. and one hour prior to performance time.